We start our new fitness program next week. 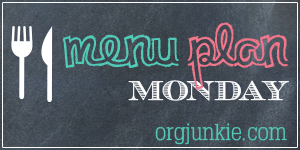 This week’s menu is all about finishing up the foods we have. Before starting a new eating plan it’s important to clear all the not so good for you food out. If it’s not there it can’t tempt you. The Eat What You’ve Got Challenge helped me clear most things out of our pantry, fridge & freezer. I’m finishing up the few things we have left in this week’s menu. Next week we start Beachbody’s latest fitness program from Shaun T, Transform:20. I’m so excited! Transform:20 is available on Beachbody On Demand- learn more here. I’ve taken a peek at the meal plan and it looks to be similar to 21 Day Fix, 80 Day Obsession, LIIFT4 and other Beachbody programs that use the color coded containers. I’ll have all the details for you soon. If you’re not ready to go all in on a fitness & eating plan but do want to make some changes you’ll want to check out The Healthy Tweaks Challenge. It’s 4 weeks of small changes to help you make a big improvement in your health & fitness.